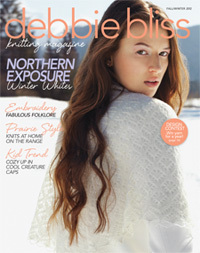 This fall marks both the 10-year anniversary of Debbie Bliss’ yarn line and the fourth anniversary of her namesake magazine, so Vogue Knitting took the chance to interview her and talk about inspiration, family and trends. She says that she loves to design things that fit the proportions of a woman’s body and that she uses trends and fashion colors as inspiration in her design work. She also credits living in England as a great benefit to someone putting together a magazine because it’s relatively easy to go to another country to find the perfect location for a photo shoot!